Belt loop to fit holsters with item number 20IMZ .. 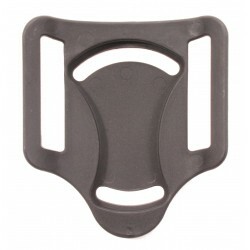 The holster can be mounted in high ride, mid ride and low ride positions. Angle of the holster can be varied. Belt loop accomodates belts up to 40mm wide, if the barriers inside the belt loop are cut the belt loop accepts belts up to 50mm wide. Wechselsteg ist geplant für meine Magazintasche, Lieferung auch gut und schnell !